I picked up this little treat on a whim on a visit to my local pound store﻿ and will definitely be buying it again. 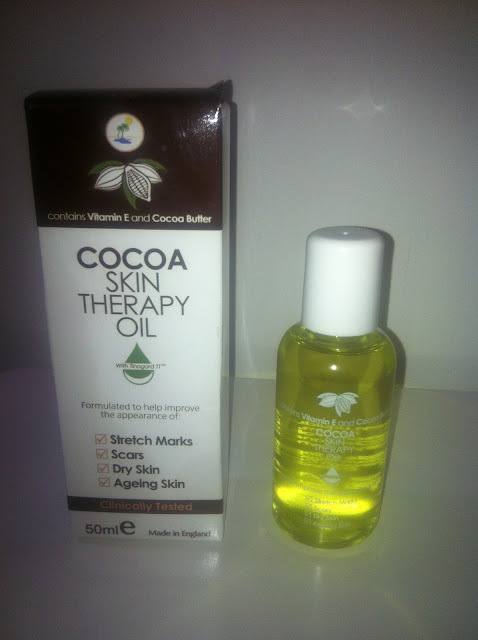 Its a body oil containing Vitamin E and Cocoa Butter which claims to improve the appearance of stretch marks, scars, dry skin and ageing. I have been using it for a couple of weeks and it makes a lovely moisturiser, for very dry skin. My knees, elbows and feet are problem areas for dry skin so this has been really handy. Sometimes Cocoa Butter products can smell a bit sickly but this one wasn't. It still has that slight whiff of chocolate smell but its not over bearing. It's great as a massage oil and it comes in a 50ml bottle so handy to travel with. Bargain!